It may be bitterly cold and dry as a bone outside, but your hair shouldn’t have to suffer. Combat the dryness and damage of the season with the instant transformation of a Kérastase Fusio-Dose hair treatment. What is Fusio-Dose? It’s a magical (read: rigorously researched and scientifically tested) solution to any hair woes, perfectly customized to you, which takes effect instantly. 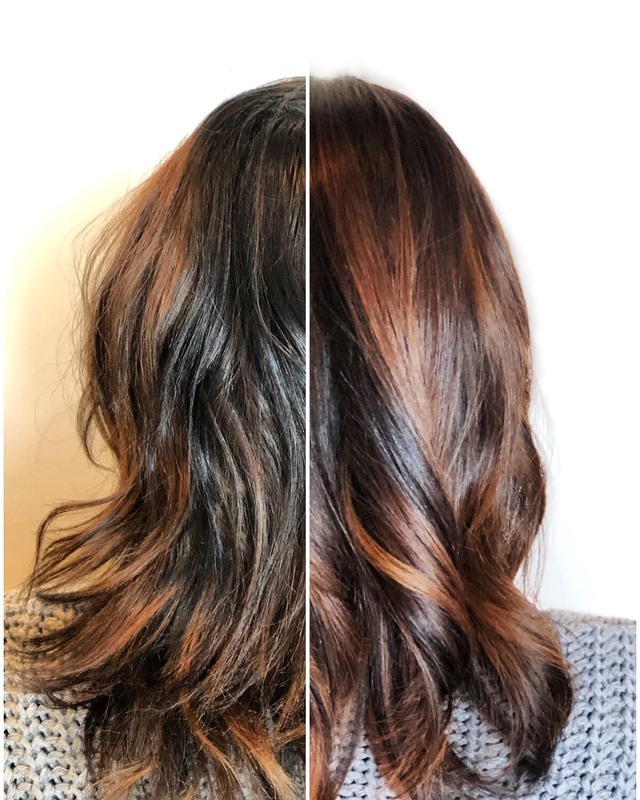 There are 20 possible hair booster combinations to strengthen hair and prolong color results between appointments, as well as add shine, density, and nutrients. Prolong your Fusio-Dose results with the new Fusio-Dose HomeLab, containing four personalized at-home applications. Prescribed by your stylist for instant effectiveness, this kit brings the luxury of the salon to the comfort of your home. Before + after Fusio-Dose treatment by Salon Assistant Julia C.
I like how shiny and conditioned the hair gets. The more Fusio-Dose treatments you get, the better the results. It treats more than one hair concern at once, and fast. It penetrates into the hair instead of sitting on the surface like other deep conditioners or masks. I love it! It's quick, it's customized, it's life-changing! $5 off Fusio-Dose and 15% off Kérastase shampoo and conditioners valid through 2/28/19. 15% off Kérastase shampoo and conditioners valid only on the same day as Fusio-Dose service is received. Not valid on Kérastase styling products or any other brands. Not to be combined with any other offers or promotions. While supplies last.